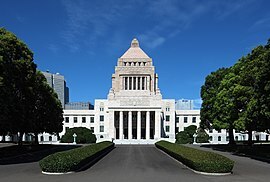 ↑ "House of Councillors The National Diet of Japan". www.sangiin.go.jp (अंग्रेज़ी में). अभिगमन तिथि 2017-09-09. ↑ "Diet functions". www.shugiin.go.jp (अंग्रेज़ी में). अभिगमन तिथि 2017-09-09. ↑ U.S. Library of Congress Country Studies Japan – Electoral System. Retrieved June 8, 2007. ↑ National Diet Library Issue Brief, March 11, 2008: 参議院の一票の格差・定数是正問題 Retrieved December 17, 2009. ↑ nikkei.net, September 29, 2009: １票の格差、大法廷30日判決　07年参院選4.86倍 Retrieved December 17, 2009. ↑ Asahi Shimbun, August 18, 2009: 有権者９８万人増　「一票の格差」２．３倍に拡大 Retrieved December 17, 2002. ↑ Fukue, Natsuko, "The basics of being a lawmaker at the Diet", The Japan Times, January 4, 2011, p. 3. ↑ House of Councillors. Legislative Procedure. Published 2001. Retrieved July 15, 2007. ↑ Asia Times Online Japan: A political tsunami approaches. By Hisane Masaki. Published July 6, 2007. Retrieved July 15, 2007. ↑ "Diet | Japanese government". Encyclopedia Britannica (अंग्रेज़ी में). अभिगमन तिथि 2017-08-22. ↑ House of Representatives of Japan Disagreement between the Two Houses. Retrieved July 14, 2007. ↑ House of Representatives of Japan Sessions of the Diet. Retrieved July 14, 2007. ↑ House of Representatives of Japan Opening Ceremony and Speeches on Government Policy. Retrieved July 14, 2007. ↑ House of Representatives of Japan From Imperial Diet to National Diet. Retrieved July 15, 2007. ↑ Ministry of Internal Affairs and Communication. Chapter 27 – Government Employees and Elections. Published 2003. Retrieved June 8, 2007. ↑ Library of Congress County Data. Japan – The Legislature. Retrieved June 8, 2007.